There are now two ways to view Bond Falls. 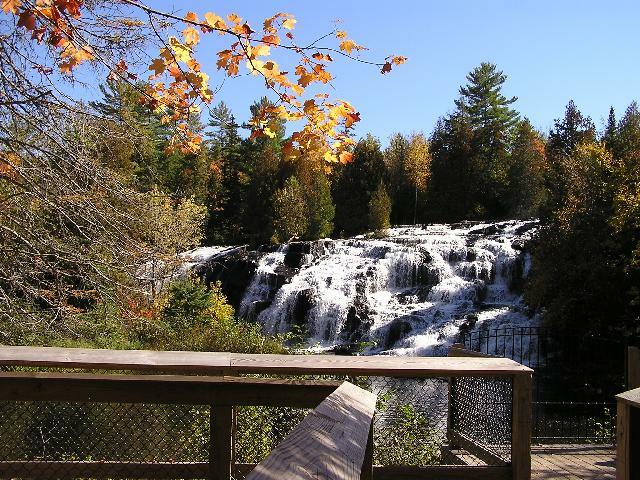 One is to stay on Bond Falls Road until you reach the falls and park either along the road or in the small parking area across the road from the falls. The trail is easy to follow from the parking lot but includes many steps and a viewing area half way down the falls. It is steep at times, but well worth the walk. One advantage of taking this way is that you can see other falls on the way down to the big falls. The other way is to turn left on the new road that goes down the hill just before you come to the falls as you are coming from US-45 in Paulding. The sign says something like Bond Scenic Area or something like that. This road takes you down to the bottom of the falls where there is a large parking lot, two restrooms, and a handicapped-accessible blacktop walk to the falls. The first photo above shows the wooden walk that provides a place to view the falls. It and the second fall show the right side of the falls. 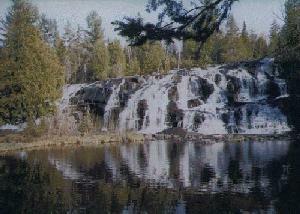 the third photo shows the left side of the falls. The last photo above shows the entire waterfall. 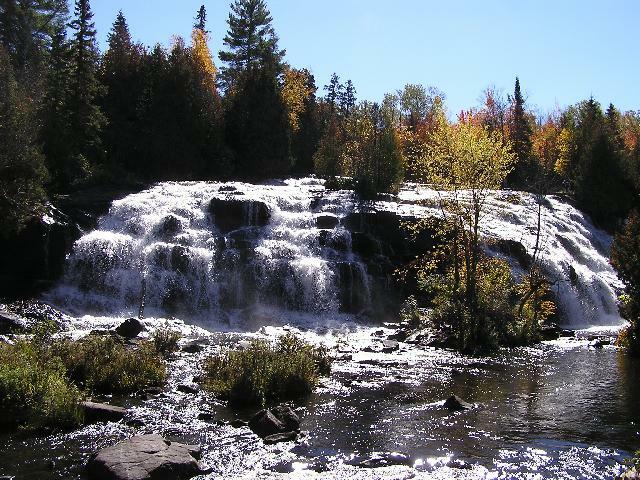 These photos were taken when I last visited the falls on October 2, 2006. The photo to the right is a photo I took on a previous trip with my older camera, which shows a better reflection in the water. 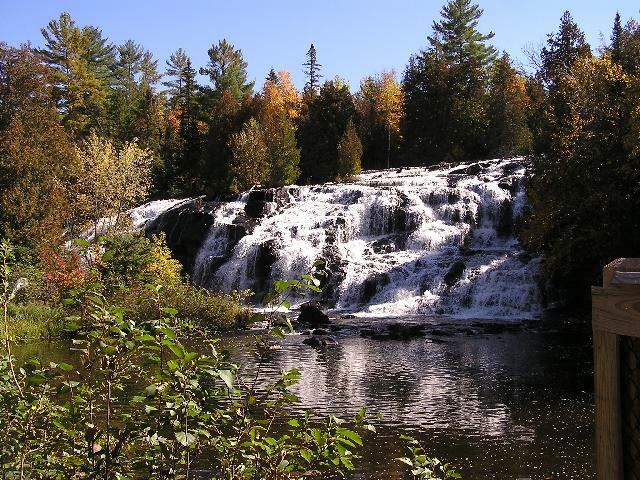 This is one of the most impressive waterfalls in Upper Michigan and is quite accessible. I have taken my mother when she was 78 and my grandson Ryan at age 10, and both managed the trail with no difficulty. 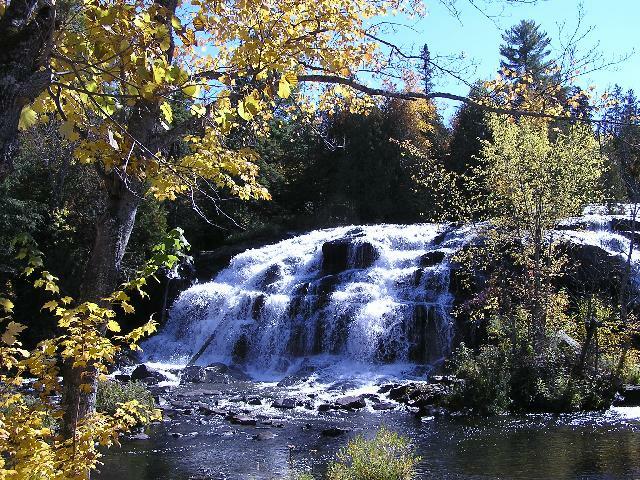 (See Ryan's Trip Journal about his trip to Bond Falls and a Picture of Ryan at Bond Falls). However, if the new road had been built when I was there with my parents, my father, who needed a wheelchair, could have seen the falls as well. Across Bond Falls Road from the falls is a small outpost where you can buy souveniers and light refreshments. One thing I never miss when I am there is a Jilbert's Mackinac Island Fudge ice cream cone! There is a campground nearby for those interested. Page last updated 11 Oct 2006.